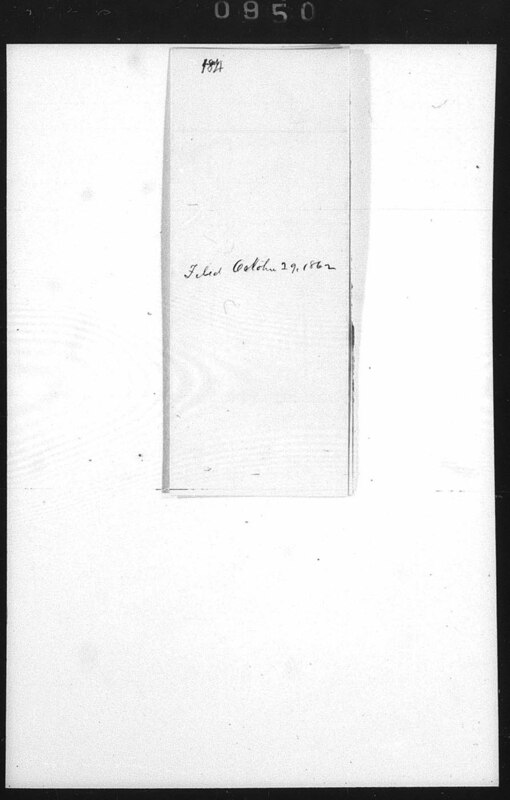 Source Text: A microfilm reproduction of the original document held at the National Archives and Records Administration, Microcopy 520, Reel 2. The original document is held in the Records of the Accounting Officers of the Department of the Treasury, 1775–1978, National Archives and Records Administration, Record Group 217.6.5. 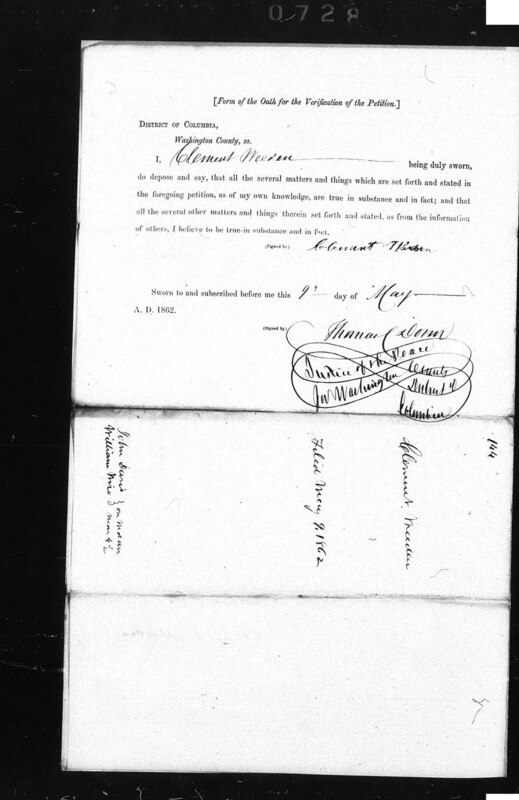 Within the National Archives' Archival Description Catalog, see ARC Identifier 4644616 / MLR Number A1 347 (http://arcweb.archives.gov). Enable highlighting of handwritten text. To the Commissioners under the act of Congress approved the 16th of April, 1862, entitled "An act for the release of certain persons held to service or labor in the District of Columbia." 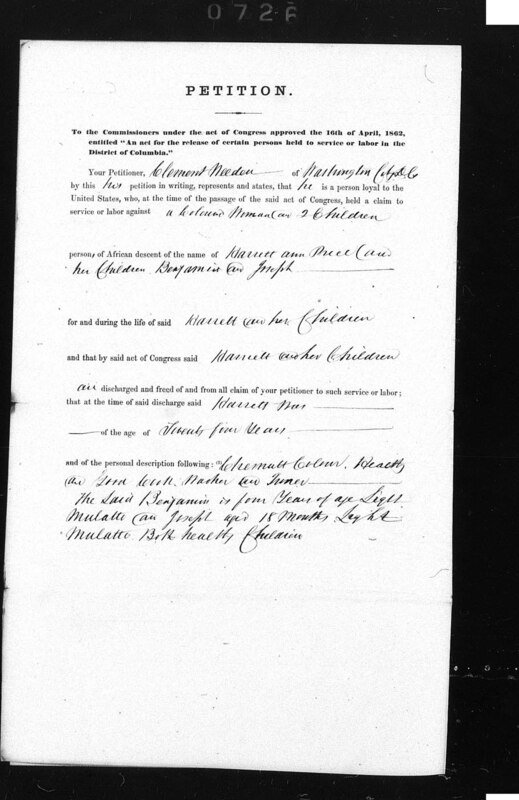 Your Petitioner, Clement Weeden of Washington City D.C. by this his petition in writing, represents and states, that he is a person loyal to the United States, who, at the time of the passage of the said act of Congress, held a claim to service or labor against a Coloured​ Woman and 2 Children persons of African descent of the name of Harrett​ Ann Price and her Children Benjamin and Joseph for and during the life of said Harrett​ and her Children and that by said act of Congress said Harriett and her children are discharged and freed of and from all claim of your petitioner to such service or labor; that at the time of said discharge said Harrett​ was of the age of Twenty four Years and of the personal description following:(1) Chesnutt​ Colour​, Healthy and Good Cook, Washer and Ironer. That your petitioner acquired his claim to the aforesaid service or labor of said Woman and her Children in manner following:(2) by Marriage with Ann Marie Hancock of Allexandria​ County state of Virginia then forming a part of the District of Columbia. She inheriting them from my father Clement Weeden residing in Anne Arundel County of Washington State of Maryland, he presenting her with said Harrett​ in the year 1854. The Children above named having been Born in my family. and to the Best of my Knowledge and Belief neither of them has any moral defect. Your petitioner hereby declares that he bears true and faithful allegiance to the Government of the United States, and that he has not borne arms against the United States in the present rebellion, nor in any way given aid or comfort thereto. 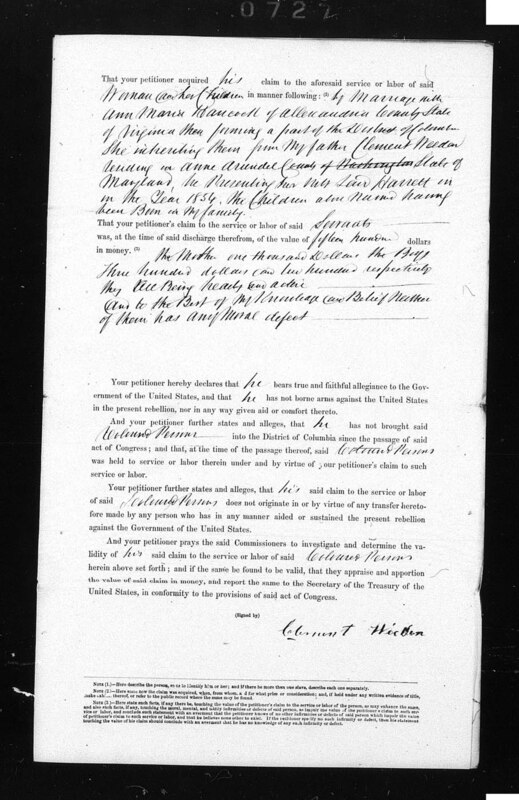 And your petitioner further states and alleges, that he has not brought said Coloured​ Persons into the District of Columbia since the passage of said act of Congress; and that, at the time of the passage thereof, said Coloured​ Persons was held to service or labor therein under and by virtue of your petitioner's claim to such service or labor. Your petitioner further states and alleges, that his said claim to the service or labor of said Coloured​ Persons does not originate in or by virtue of any transfer heretofore made by any person who has in any manner aided or sustained the present rebellion against the Government of the United States. 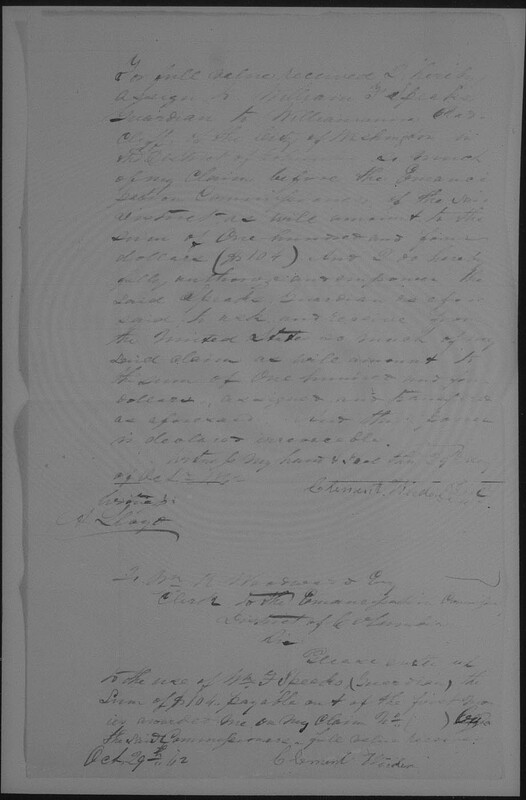 And your petitioner prays the said Commissioners to investigate and determine the validity of his said claim to the service or labor of said Coloured​ Persons herein above set forth; and if the same be found to be valid, that they appraise and apportion the value of said claim in money, and report the same to the Secretary of the Treasury of the United States, in conformity to the provisions of said act of Congress. I, Clement Weeden being duly sworn, do depose and say, that all the several matters and things which are set forth and stated in the foregoing petition, as of my own knowledge, are true in substance and in fact; and that all the several other matters and things therein set forth and stated, as from the information of others, I believe to be true in substance and in fact. For full value received I hereby assign to William F. Speaks Guardian to [Williamanna?] Radcliff, to the City of Washington in the District of Columbia as much of my claim before the Emancipation Commissioners, of the said district, as will amount to the sum of One hundred and four dollars ($104). And I do hereby fully authorize and empower the said Speaks, Guardian as aforesaid, to ask and receive from the United States so much of my said claim as will amount to the sum of One hundred and four dollars, assigned, and transferred as aforesaid. and this [bond?] is declared irrevocable. Note (1.) -- Here describe the person, so as to identify him or her; and if there be more than one slave, describe each one separately. Note (2.) -- Here state how the claim was acquired, when, from whom, and for what price or consideration; and, if held under any written evidence of title, make exhibit thereof, or refer to the public record where the same may be found. Note (3.) -- Here state such facts, if any there be, touching the value of the petitioner's claim to the service or labor of the person, as may enhance the same, and also such facts, if any, touching the moral, mental, and bodily infirmities or defects of said person, as impair the value of the petitioner's claim to such service or labor, and conclude such statement with an averment that the petitioner knows of no other infirmities or defects of said person which impair the value of petitioner's claim to such service or labor, and that he believes none other to exist. If the petitioner specify no such infirmity or defect, then his statement touching the value of his claim should conclude with an averment that he has no knowledge of any such infirmity or defect. Transcription and encoding: Elizabeth Lorang, Courtney Geerhart, Rhiannon Root, Robert Voss, Janel Cayer, Katherine Walter, and Kevin McMullen.